In 1892, Brooklyn Park Commissioner, George V. Brower purchased 4 acres of land in the Bedford neighborhood of Brooklyn. This parcel later became ‘Bedford Park.’ It was one of many new parks “that would bring ‘fresh air and breathing spots for the people,” a July 1892 Brooklyn Eagle headline declared. Urban planners were beginning to see the importance of parks in the rapidly urbanizing city of Brooklyn. Industrialization during the Gilded Age filled the cities with immigrants from Europe and rural America. Fear of the loss of America’s wilderness to development led to a national preservation movement that culminated in the creation of the National Parks Service by an act of Congress in 1916. Prior to this Congress reserved millions of acres to create 14 national parks the oldest of which is Yellowstone Park created in 1872. 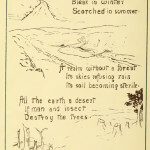 Theodore Roosevelt, born in New York City, elected Governor of New York State in 1898 and the 26th president of the United States (1901–1909) was an avid naturalist who “advanced park and forestry programs.” Commissioner Brower thought it important to preserve the natural beauty of each new park site and avoid leveling the terrain to build formal gardens. 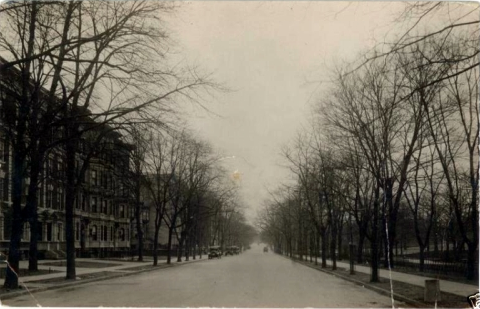 Bedford Park served as a centerpiece in many of the real estate ads for the St. Marks District (formerly Bedford) that is now Crown Heights North. 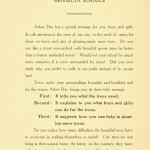 In September 1894, the Brooklyn Daily Eagle described Bedford Park in appreciative tones. 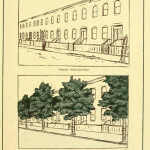 The Adam Newton House, on the corner of St, Marks and Brooklyn Avenues, was leased by the Brooklyn Institute of Arts and Sciences in 1893 as a temporary home during the construction of their new museum building on Eastern Parkway–Park Planning for Greater New York (1890 -1898) annual report. The Brooklyn Institute of Arts and Sciences was formed in 1843, the forebear of the Brooklyn Museum. The Brooklyn Academy of Music, the Brooklyn Children’s Museum, and the Brooklyn Botanic Garden–were divisions of the institute until the 1970s. Eventually, more than five science departments and a public library were moved into the mansion. Lectures and exhibits attracted visitors to the park to enjoy its natural non-landscaped terrain. When the Brooklyn Institute moved to its new building in 1897–Brooklyn Museum About: The Museum’s Building–the Brooklyn Children’s Museum remained in the mansion. In 1895, according to the annual report of the Brooklyn Department of Parks, Bedford Park’s four acres had an estimated value of $150,000 ($4 million in 2014 dollars) with 2 patrolman assigned (of the 91 patrolman on the force) to the park. A drinking fountain was added and the Bedford Park mansion repaired to meet health and safety requirements. In 1895 the City of Brooklyn doubled the park’s acreage by purchasing the block of old mansions on St. Marks Avenue as stated in the Thirty-Fifth Annual Report of the Department of Parks of the City of Brooklyn, 1896. George V. Brower served as the Park’s Commissioner from 1889 to 1894 and from 1898 – 1891. His second service was to the newly incorporated City of New York (1898). He built his home close to Bedford Park on the southeastern corner of Park Place and Kingston Ave. He had planned to tear down the Newton Adams House and extend the park to St. Marks Avenue. but the City decided to lease the property in 1899 to the Brooklyn Children’s Museum. For the first time, an American museum encouraged children to interact with exhibits, participate in project workshops, and learn about the museum’s collections, and the surrounding natural world of the park. In 1905, a classically designed comfort station was built near Brooklyn Avenue and Prospect Place. Both the Straus family of Abraham & Strauss and Clarence W. Seamans lived on St. Marks Avenue. A World War I Tree Memorial was placed in Bedford Park in 1917. George V. Brower died in 1921. In 1923, the park property was extended to include the block that contained the Brooklyn Children’s Museum and other houses, between Prospect Place and St. Marks Avenue. 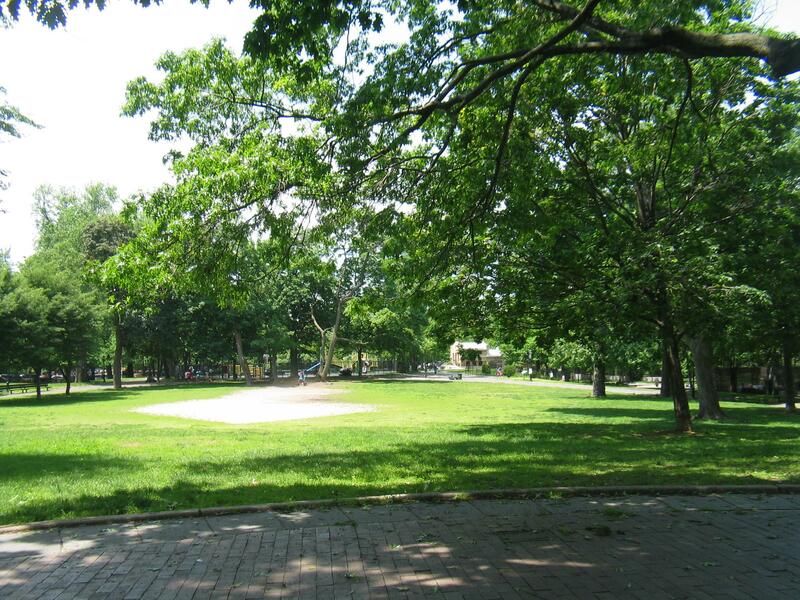 Bedford Park became Brower Park in 1923 to honor the recently deceased Park Commissioner. Photograph 1: Brower Park 2015. In 1936, a water fountain, walkways, and playgrounds were added. In 1947, the last parcel of land adjacent to the Children’s Museum’s two houses along St., Marks Avenue were purchased. The George V. Brower elementary school was built on the Eastern part of the land in 1958 and Prospect Place running from Brooklyn Avenue to Kingston Avenue was closed and new playgrounds and handball courts erected. In 1977, a new museum opened, replacing the two old mansions that had served as the museum’s home. The entire museum, designed by Hardy Holtzman Pfeiffer “was underground, with roof gardens and an amphitheater that blended into the topography of the park”–Morris, Walkabout:Brooklyn’s Small Parks: Brower Park, pt.2, 2012. Although neglect and crime has caused a degradation of the park’s reputation and green infrastructure, the museum’s popularity kept families coming to Crown Heights and helped preserve the park. In 2008, the Pfeiffer building was replaced by a modern structure designed by Rafael Vinoly. A large yellow two-story building covered in yellow ceramic tiles was built to enclose Pfeiffer’s underground structure. It is New York City’s first “green” museum. Today, Brower Park is once again becoming a respite from the concrete gardens and asphalt streets that surround it. A new Monarch Butterfly Garden, built by the community in the spring of 2014, is recreating the Monarch Butterfly’s natural habitat. This project has renewed community interest in using the park’s recreational resources but it is also developing awareness of the need for community involvement in preserving the park’s natural infrastructure. Friends of Brower Park is committed to bringing the community into the park in order to introduce them to the ecosystems that govern all life on the planet earth. We are also committed to bringing the community into the park through programming events that are fun, recreational, and educational. On June 8, 2016 the Shirley Chisholm Circle was dedicated. A memorial stone stands opposite Theodore Roosevelt’s stone memorial and is accompanied by a memorial oak tree. In the tradition of George V. Brower and Theodore Roosevelt, Friends of Brower Park is working toward making Brower Park an example of community stewardship, activism, and sustainable green spaces. 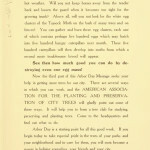 The importance of preserving the natural world we humans inhabit and the necessity of caring for and protecting Brooklyn’s urban forest is not a new idea as this historic 1911 pamphlet written for young people demonstrates. The Brooklyn Institute of Arts and Sciences used Bedford Park (now Brower Park) as an environment to learn about the natural world. Mapping the trees was just one of the many discovery activities held with the park.